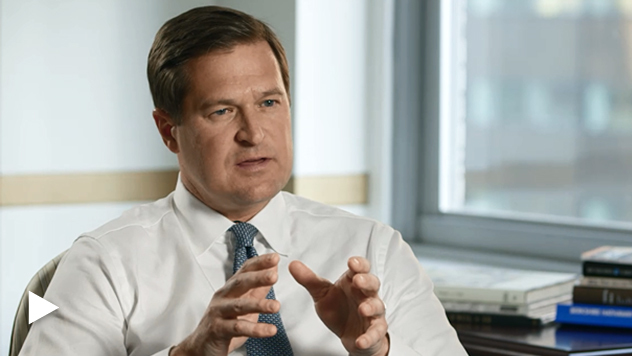 Portfolio Manager Steven McBoyle discusses the attributes that make our Premier Quality Strategy distinctive. What is Premier’s ‘secret sauce’? The secret sauce of Premier is the process itself. It’s the process of combining insight and fortitude—insight related to moat analysis, effectively business model analysis. Start with the premise that moats have mortality tables. Invariably returns lessen over time unless companies have very unique attributes. So we within Premier spend an inordinate amount of time digging into the entire industry, the value chain. We refer to it as ecosystem analysis. And again, all for the purpose of trying to attempt to identify the attributes that make a particular moat unique. So that’s the insight part of the secret sauce of the process. The secret sauce of Premier is the process itself. It’s the process of combining insight and fortitude—insight related to moat analysis, effectively business model analysis. Then there’s fortitude. Fortitude comes by way of building conviction. Now conviction also comes by way of dismantling the business and appreciating the underlying attributes. But conviction also comes by way of really just the luxury of time that we have, in that we have again the ability to analyze management’s critical decisions as it relates to how ecosystem forces are changing capital allocation. And that builds conviction. So I would say the secret sauce to Premier is the exact process of building insight and fortitude in terms of identifying these elite business models. So a most recent example would be the RV industry. And so in this case, which we can often do from a pattern recognition perspective, is categorize it. What I mean by that is, oftentimes when you see consolidating industries you have the ability to eliminate irrational behavior. Meaning price discipline can be introduced to the value chain where it did not exist before. Some time back we were early to identify one of two combinations. One, there is significant consolidation across the value chain, both at the manufacturing level as well as the dealer level. And then secondarily, there was a transition that I think we picked up on early, where there was a level of sophistication introduced to the dealer base that did not exist before. Now why was that important? Because it was really a powerful effect of the dealer dictating the product strategies at the manufacturing level. It, in turn, drove product production discipline. And also created an entirely new asset class that was introduced to potential RV consumers. Why is compounding so important in this strategy? Compounding has three distinct requirements, three ingredients. One, you have to have higher rates of return on capital. Two, you have to have the ability to reinvest back into that business, referred to as the plowback ratio, at those structurally high rates of return. And then the third ingredient is for the market to recognize it, effectively what’s often referred to as Buffett’s market value to book value test. As long as the underlying dollar of book value that is earned, built, the market value appreciates it at a dollar or greater. This is a market analysis, a moat analysis that insures that we’ve identified a situation where companies are going to be able to reinvest back at above market rates of return on capital.